Jeff Pape discussed his no-till practices with Orlan Love, The (Cedar Rapids) Gazette staff writer, in a front page article on soil health that centered on the NRCS’s Ray Archuleta. A PDF of the article is at The Gazette, 10.20.14. Jeff Pape, Hewitt Creek Watershed Improvement Association president, reviewed Iowa’s nutrient reduction strategy efforts for the Iowa Farm Bureau Federation convention in December, 2013. Read the article written by Jean Caspers-Simmet at AgrNews 12.26.13. Iowa Representative Chuck Isenhart’s, D-Dubuque, wrote a guest column that appeared in several Iowa newspapers in April, 2013, including the Cedar Rapids Gazette (C Isenhart column Gazette). Rep. Isenhart is ranking member on the Iowa House environmental protection committee. Dyersville, IA (April 2012) — What prevents soil erosion, improves the nutrient cycling, sustains the soils and protects the environment? For some producers in Hewitt Creek Watershed answering that question involves a return to an old practice — cover crops. Ten producers in the watershed improvement project signed up to plant cover crops last year and two of them, Jeff Pape and Mike Knipper, Dyersville, were among a half dozen who used aerial seeding of cover crops on crop ground just before the 2011 harvest. Jeff, who is chairman of the Hewitt Creek Watershed council, planted winter rye and oats on two separate 15-acre fields near his farmstead north of Dyersville. Knipper planted winter rye on 24 acres of corn ground. These “experiments” with cover crops grew out of discussions at the watershed council meetings. Cover crops are part of the menu of practices the council makes available with incentives to watershed producers. Last year it facilitated cover crop planting by scheduling the aerial applications with Ben Zitelman of Three Rivers FS. 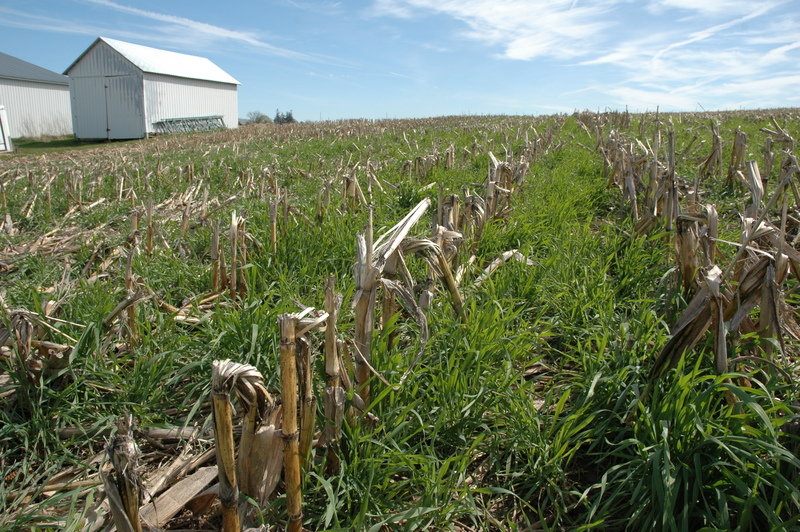 Cover crops and the other incentive practices are part of an effort to improve both farm management and water quality in the watershed. One important benefit of cover crops is soil building. Pape has been using no-till on his farm since 1995, primarily because of its lower labor and equipment costs, but also because it’s easier on the soil. He’s also looking at practices that will benefit soil structure, such as cover crops. Winter rye cover crop in corn stubble on Jeff Pape’s farm, prior to application of herbicide this spring. Jeff planted the oats for erosion control in a different field, east of the homestead, where the slopes of 2 to 7 percent. The oats froze last winter making Roundup unecessary. Mike Knipper’s farm is east of Dyersville along a Hewitt tributary sometimes known as Sand Creek. He planted winter rye on 24 acres of corn that’ll be planted to soybeans this year, primarily for soil control and improvement. The ground is more fragile, sandy and rocky, so the cover crop should aid in improving the soil. This isn’t the first time that he’s tried cover crops, but both Pape and Knipper point to the role of the watershed group in aiding their decision for 2011, both with incentives and facilitating aerial seeding. “I wouldn’t have gotten it done without the watershed (group),” says Knipper. Mike Knipper with winter rye cover crop on corn stubble. Hewitt Creek watershed is 23,005 acres in west Dubuque County; the primary land use is agriculture. The watershed is northeast of Dyersville, where Hewitt flows into the North Fork of the Maquoketa River. The Hewitt Creek Watershed group formed in 2006 and received early funding from the Iowa Farm Bureau and a three-year grant from the Iowa Water Improvement Board enabling the council to provide incentives for practices targeted at improving water quality. The council received a second three-year WIRB grant in 2010. Cover crops are also part of the Natural Resources Conservation Service Conservation Stewardship Program in Dubuque County. The county is also participating in the Mississippi River Basin Initiative. Matt Welsh, Dubuque SCWD, reported on the MRBI project progress at the Hewitt Creek meeting on Jan. 24, 2012. The project received notification of 2012 EQIP allocations: MRBI cropland practice – $586,085 & MRBI ag waste – $879,127. There are 3 important dates for sign up cutoff: Feb 3 – 1st cutoff, Mar 30 – 2nd cutoff and Jun 1 – 3rd and final cutoff. Please check with Matt if you have interest. He will be able to explain 2012 program differences in nutrient management, confinement buildings and cover crops. As you will see, the following NRCS video was filmed in Hewitt Creek watershed. Good job Tim Daly & Matt Welsh. 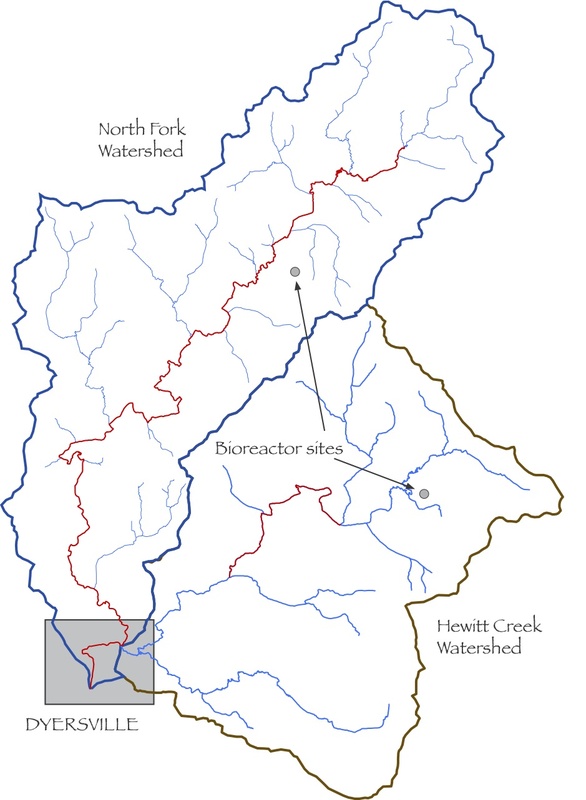 (Sept. 6, 2011) In its second year the Mississippi River Basin Initiative (MRBI) made $1.34 million in EQIP money available to the three watersheds of the north fork of Maquoketa River above Dyersville. Of this $639,336 was directed towards projects in Coffee Creek and North Fork Maquoketa watersheds. Another $35,160 was provided for nutrient management plans in the watershed. Hewitt Creek programs accounted for $440,105, including nutrient management plans, and Bear Creek $229,025, also including nutrient management plans. Matthew Welsh of the Dubuque NRCS office in Epworth visited Hewitt and North Fork watershed councils in August to give details on the 2011 program. Practices that are planned for implementation this fall are cover crops on highly erodible ground, waterways, terraces, nutrient management plans, water sediment control basins, manure storage structures, and roofed buildings. Numerous supporting practices are also being constructed or implemented. Producers who have applied nutrient management reporting in 2012 should start making notes and documentation of applications starting this fall, Welsh said. For more information, contact the NRCS office at 563.876.3418. Welsh also said there are plans to hold regular MRBI project meetings quarterly. The most likely site is the Dyersville library, he added. Planning suggests that each meeting would be devoted to workshops or guest speakers – about half the time – and administrative and technical issues – about one quarter of the time for each. Meeting dates will be finalized soon, and notices will go out to watershed landowners and operators. Welsh said previous meetings were lightly attended but admitted that they were also lightly publicized. The three MRBI watersheds contain about 75,400 acres. The creeks join in Dyersville. Two new woodchip bioreactors were installed this summer in producer fields in the North Fork Maquoketa Headwaters and Hewitt Creek watersheds in northwest Dubuque County. The bioreactors, designed by Iowa State University Extension, were installed on the farms of Ernie Goebel, New Vienna, and Al Wente, Farley. Two bioreactors were installed during the summer of 2011 in the watersheds above Dyersville, Iowa. Installation of both bioreactors came about because of efforts by the watershed councils and the producers in the watersheds, who learned about bioreactors installed in other Iowa Watersheds. Funding for both came from Iowa Watershed Improvement Board grants. 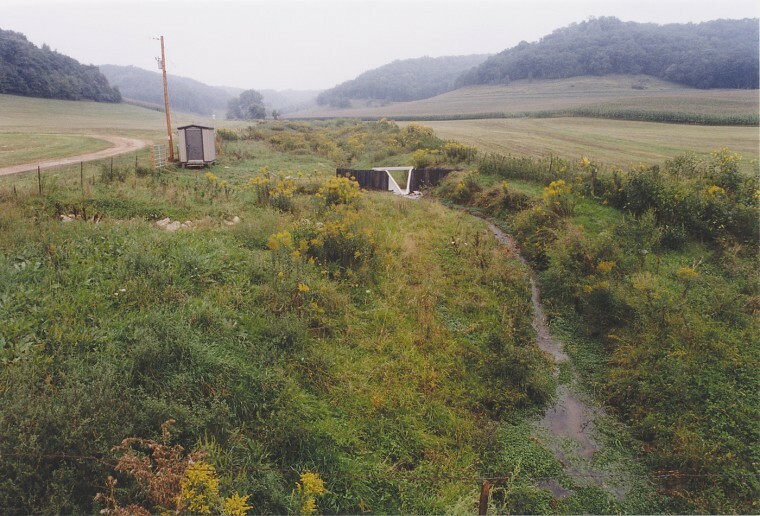 In Hewitt Creek the bioreactor installation was written into the 2010 request for funding by the watershed council. The Hewitt Watershed council plans to do two or three additional bioreactor installations during the run of the grant. In North Fork the structure funds came from existing WIRB money designated for on-farm demonstrations. Bioreactors are part of a continuing effort to find effective ways to reduce excessive nitrogen–nitrate in water draining from farm tile lines. The nitrates can eventually drain to the Mississippi and into the Gulf of Mexico. These bioreactors are basically trenches (these are about 15 feet wide, 100 feet long and about 4 feet deep) filled with an organic material that serves as a carbon source—most use hardwood chips—for an anaerobic reaction. The bioreactor is tied into field tile lines with control structures at the top and bottom ends and covered with a permeable fabric, then about 12 to 18 inches of soil. In operation, water flows from the tile into the bioreactor, where bacteria feed off carbon in the chips, and “breathe” oxygen in the nitrate to free nitrogen into a gaseous form. There’s a slight slope to the basin and the water flows into an outlet tile at the bottom and into a stream. Tile for each bioreactor drain water from approximately 70 acres. The inlet control structure allows for overflow when tile lines are running full—typically that happens only a few times a year. Both producers volunteered their farm as bioreactor sites. Surveys of the two locations was done early this past spring by the Dubuque Natural Resources and Conservation Service. Both bioreactors are located in buffer areas so work could be completed during the growing season and not disrupt the crop during growing season. Schlietz Construction and Ernie installed the bioreactor on his farm; Jeff Pape and Al Wente installed the other structure. The Wente bioreactor is adjacent to the stream and because of this, differs slightly from Goebel’s. There’s a plastic liner along the streamside wall to keep water from seeping through and the bank stable. The inlet/outlet structures allow water samples to be taken and analyzed. At both watershed council meetings held in late August it was announced that funds from the Mississippi River Basin Initiative (MRBI) will be used for installation of automated sampling equipment at both bioreactors and continuing monitoring. • Article published in the Dyersville Commercial featuring Al Wente – to view click here. • Pay-for-results concept tested — Feedstuffs article May 13, 2011. Two-page information PDF on the Hewitt Creek Watershed Project: Hewitt project summary.